As the NFL season officially starts tonight I though it would be a perfect time to share this recipe for a unique and delicious chowder! Two of my husband’s co-workers sent him home with beautiful fresh corn from their gardens and I wanted to do something fun with it instead of just having corn on the cob. 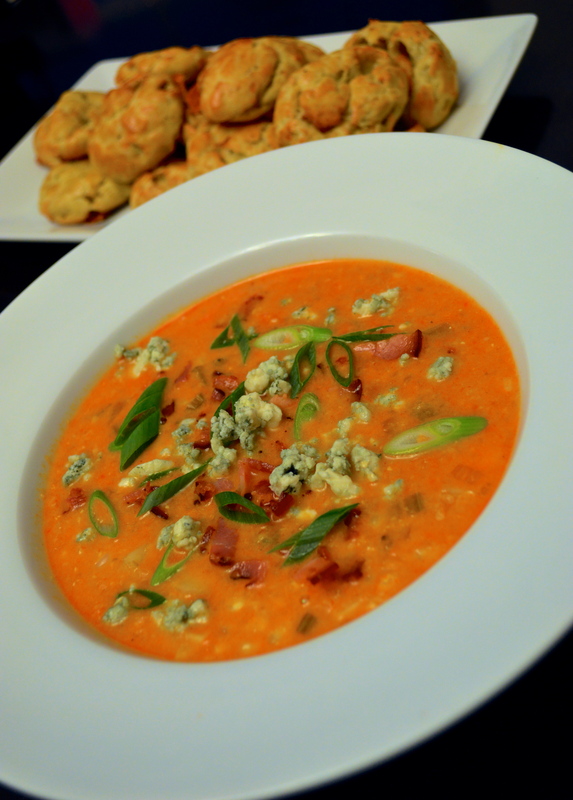 This is a fun and spicy spin on corn chowder, made a bit fancier with the addition of blue cheese crumbles, bacon and amazing homemade blue cheese gougères. These little cheese puffs are the perfect compliment to the super flavorful chowder and it would be perfect to make this weekend for all the football games! This recipe is adapted from Half Baked Harvest, found HERE. First make the gougères which are basically cheese puffs, they’re made from a french choux pastry with blue cheese beaten in at the end. We used gorgonzola because it’s our favorite but you can use a danish blue cheese if you prefer! Preheat the oven to 425 F and line a baking sheet with a silpat liner or parchment paper. In a small saucepan over medium heat combine 1/2 cup milk, 1/2 stick of unsalted butter (cut into small pieces), 1 tsp freshly ground black pepper, 1/2 tsp chili powder and 1/2 tsp salt (1). Bring to a boil, stirring until the butter is melted and then reduce to the heat to medium-low. Stir in 2/3 cup flour (2) and stir constantly until a dough forms, which only takes about 30 seconds. Put the dough in the bowl of a stand mixer (3) and beat on medium speed for 2 minutes to cool it. Reduce speed to low and add 3 large eggs, one at a time, beating well after each one (4) and saving about 1 tsp of the last egg to use for an egg wash later on. 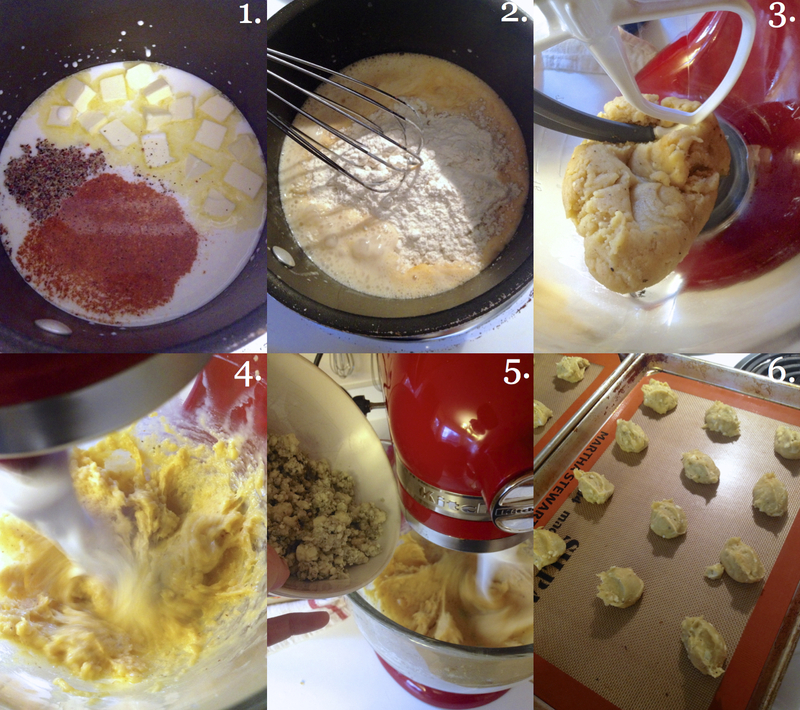 Beat in 4 oz gorgonzola cheese crumbles until just incorporated (5). Use a tbsp to drop mounds of dough onto your baking sheets, spacing about an inch apart (6). Mix about a tsp of water with the reserved egg and use a pastry brush to brush each drop of dough with the egg wash, flattening any points. Bake for 10 minutes, then reduce the temp to 350 and bake for 15 – 20 minutes more until the gougères are puffed, golden brown and dry to the touch. You can make these ahead of time then just warm up at 350 for a few minutes to heat through. Next make the chowder. Melt 2 tbsp unsalted butter in a glass measuring cup then add 1 cup hot sauce (we use anchor bar wing sauce, since we are in Buffalo after all!) and whisk to combine (1), set aside. Heat a dutch oven or large pot over medium heat and add 4 oz thick cut bacon that’s been cut into small strips (2). Cook, stirring frequently, until crisp, then remove with a slotted spoon (leaving the fat in the pot) and set aside on paper towel lined plate. 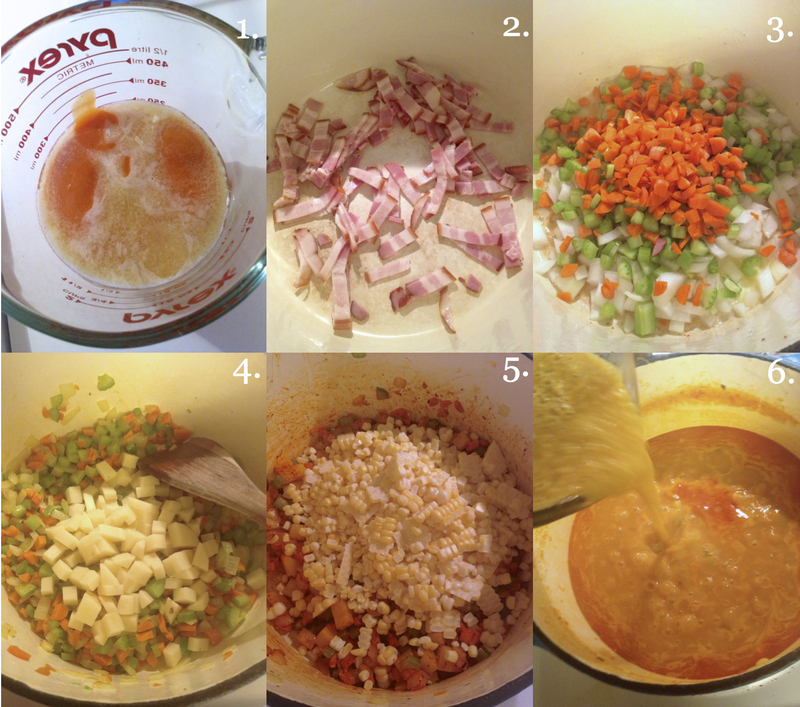 Raise the heat to medium-high and add 2/3 cup diced carrot, 2 diced stalks of celery and 1 diced medium white onion (3). Sauté for about 5 minutes until softened then add in 1 medium russet potato that’s been peeled and diced (4). Cook for 5 minutes more then add 2 minced cloves of garlic, 1/2 tbsp paprika and 1/2 tsp red pepper flakes. Add in the kernels from 5 fresh ears of corn (5), season with salt and pepper and cook for 5 more minutes. Add 24 oz vegetable stock, 1 cup heavy cream and the buffalo sauce/butter you mixed up previously to the pot, stir to combine and simmer for 15 minutes. Ladle about a third of the soup into a blender and pulse until creamy, then pour back into the soup to combine (6). This step is optional but I think it gives a thick creaminess to the soup that would be lacking if you didn’t. Season the chowder with salt and pepper, serve in bowls garnished with the reserved bacon crumbles, sliced scallions and gorgonzola crumbles. Serve the gougères on the side. Make the gougères: Preheat the oven to 425 F and line a baking sheet with a silpat liner or parchment paper. In a small saucepan over medium heat combine milk, butter, black pepper, chili powder and salt. Bring to a boil, stirring until the butter is melted and then reduce to the heat to medium-low. Stir in flour and stir constantly until a dough forms, which only takes about 30 seconds. Put the dough in the bowl of a stand mixer and beat on medium speed for 2 minutes to cool it. Reduce speed to low and add the eggs, one at a time, beating well after each one and saving about 1 tsp of the last egg to use for an egg wash later on. Beat in the gorgonzola until just incorporated. Use a tbsp to drop mounds of dough onto your baking sheets, spacing about an inch apart. Mix about a tsp of water with the reserved egg and use a pastry brush to brush each drop of dough with the egg wash, flattening any points. Bake for 10 minutes, then reduce the temp to 350 and bake for 15 – 20 minutes more until the gougères are puffed, golden brown and dry to the touch. You can make these ahead of time then just warm up at 350 for a few minutes to heat through. Next make the chowder: Melt butter in a glass measuring cup then add the hot sauce to it and whisk to combine, set aside. Heat a dutch oven or large pot over medium heat and add the bacon. Cook, stirring frequently, until crisp, then remove with a slotted spoon (leaving the fat in the pot) and set aside on paper towel lined plate. Raise the heat to medium-high and add carrot, celery and onion. Sauté for about 5 minutes until softened then add in the potato. Cook for 5 minutes more then add the garlic, paprika and red pepper flakes. Add in the corn, season with salt & pepper and cook for 5 more minutes. Add vegetable stock, cream and the buffalo sauce/butter you mixed up previously to the pot, stir to combine and simmer for 15 minutes. Ladle about a third of the soup into a blender and pulse until creamy, then pour back into the soup to combine. Season the chowder with salt and pepper, serve in bowls garnished with the reserved bacon crumbles, sliced scallions and gorgonzola crumbles. Serve the gougères on the side. This looks fantastic. You’ve combined two things I love. I’ll definitely be trying this. Thanks! I love them both separate too so combining them was delicious!! It looks deliciuos! I love corn chowders and this, with Buffalo sauce, must be yummy yummy!! I will cook it up with a Spanish blue cheese (Cabrales) very well known here. Thank you! The Buffalo sauce gives it a fun kick that makes it more exciting than plain corn chowder, I think the cabrales will be delicious in it!